This was a piece that spawned from the end of last year’s debate on Limbo. I figured I might try to be more positive and provide an example that actual does the atmospheric storytelling well instead of ragging on Limbo all the time. I really did want to like that game. If only it wasn’t avant-garde just to catch attention and could follow through. 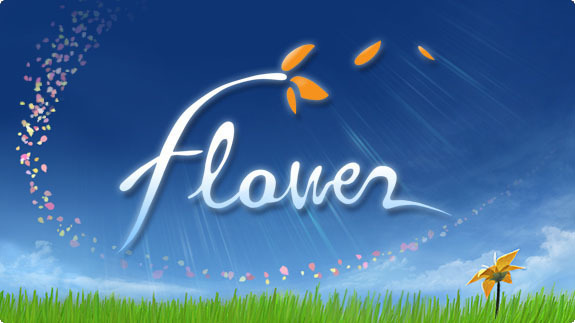 After a little time thinking of a few titles, I figured Flower was the best one to make my point. That and I’ve been wanting to write about it like a proper critic ever since I played it almost three years ago now. In a way I can see that as my growth as a critic. I may be a little off, but at least I think I’m ready to tackle it. Of course it still took more than two weeks to actually get it from first draft to published. I was ready to publish it when I realized I should expand upon the individual levels and the base thematic meaning they are trying to convey. I only did the first two originally as examples. Of course I couldn’t quite remember details of the later levels as well so I had to go back to the text. Still a great game. Of course most of it worked and I inserted the thematic details in, but oh wow does that last level tear my argument apart. My main argument that Flower is a good example of a game whose story is told via atmosphere and ambiance still holds strong, but major parts of my reading start to crumble in the face of the sixth flower. In fact I started to go on too long about it and had to cut it for the original piece. But now, after the image I will get to it, because the last two levels deserves a close reading all on its own. In looking over the last level I was astonished to find how much surrealistic imagery manifests throughout the dream city. While all the other levels had a magical quality to them and each had their own rules they played by, the small white flower seems to go the extra mile. It begins by not looking out at the city and we are thrust into the level directly. A petal floats to a space surrounded by the menacing rusted electrical towers. The petal grows a flower and upon the player pressing a button, the flower purifies the constructions out of existence. The field is brought back to life and the sky lightens. Following the level we destroy barriers of web shaped iron bars and purify more bent constructions returning life and color to the city. It’s not just nature either. Once within the city walls in the first field upon clearing certain areas it is a three story building and some streetlights that grow out of the ground instead. They don’t rise out either, but twist out like an enormous vine. Later we travel along a highway road flinging roadblocks and collecting flower petals and the road has color return to it as the same speed was travel on it. The player restores an industrial fan and uses to fly high from building top to building top, collecting flower petals and returning color to the skyscrapers. Each of these purifications have the constructions burst apart, slow in mid air and turn pure white before vanishing. There is no violence to the moment. It happens when the petal train merely touches one of the constructions or brushes past and it is accompanies by the sound of a call of a heavenly choir singing a single note. We are removing an abberation, but not because it is man made. Some of these things are hindering the growth and life of the city itself. They dull the city, constrain the buildings and create a dark atmosphere. The constructions themselves look like parasites in the environment. They attach themselves to buildings and grow from the nooks and crannies to strangle the life out of them. In the entering the final corridor of buildings, additional ones grow from the slates in the buildings to try and halt your way. Once they are all purified, color and light return to the areas they once occupied. The flower petal comes and clears it away. It purifies it and brings life to both nature and the world of man. In the final part of the level a ominous tower seemingly built from the these things looms overhead and on your approach spires grow in batches to try and halt your progress. You blast your way through them and begin you assent through in the inner workings of the tower. Three times the flower petal blasts its way through a spiderweb barrier. More and more spires try to block your way and you sail through their efforts, purifying them out of existence until you soar out of the top. The camera pulls out and you see a single point of light hanging in the sky; the trails of flower petals heading up and up towards it. Then the camera zooms in and we see that point of light is a window with a empty flower pot hovering over the sill and the chair from the menu at and askew angle. The window is hanging in the night sky showing a bright sunny day in the city it looks out on to. The flower petals, like they did in all the previous levels, streaming into a single point, in this case the flower pot, and grow a single flower as if all the collected life energy from all the other flowers collected into a single point gives life to a new flower. It doesn’t end there as the tower is bathed in light. All the spires and constructions turn white and the screen whites out. In the tower’s place we see a large sakura tree in full bloom, an eastern symbol of spring and new life and beginnings. The tree is so massive that it towers over the rest of the city, taller than any of the skyscrapers. It does’t blooms so much as collect the massive amounts of petal that float towards it and collects them on its branches. It is a cloud of pink to hang over the city. Here we see the full thematic argument of the entire game made plain. All the other dreams were mere pieces building up to the whole. Wish fulfillment of the flowers whose lives are missing something. In the youngest flower we see an idealism and hope for co-existence between the two worlds. It manifests the conflict between them as the iron constructs and the spires that stand in the way of growth and life for both nature and the city. In a way there is a Jesus motif for the light pink flower. Through it all things may be redeemed and it is the bringer of light. Peace reigns once he reaches towards the heavens and bathes the world in light, ending on an eastern symbol of peace and tranquility. In fact we get both an Eastern and Western mythology of peace and spirituality in the final level. The harmony between nature and man and then focus of the light through all things are brought to peace. Both the level’s beginning and ending sort of throw my initial reading of the game out the window in my Nightmare Mode post. It is the climax of the game, but it isn’t independent of the other levels. It picks up right were the previous dreams leaves off and ends in a far more grandiose and surreal fashion that any of the previous levels. It isn’t about the internal peace of the individual, but about the peace that can be achieved for all through societal harmony. It also emphasizes the dream of the flower being beyond what it can personally attain by wanting it to bring this dream into the real world. It dreams of its place on the windowsill and from there seeing the sakura tree, based in the dream world stretching high to the window in the sky. The final level of the game is another anomaly, but for a very different reason. It isn’t the dream of a flower, but a world within a painting of a flower. Here we have a playable denouement. Each flower releases a name of the credits hovering over the flower before the letters float up into the sky. We traverse new terrain that uses elements of the previous levels: the moving canyon walls, the lighting up of haystacks, the industrial power cable tower, the windmills etc. They are mixed and matched into a world where nature and man made constructions are existing in harmony. But more than that, the level is an artistic signature in the painting. Instead of having the credits roll at the end like movie, it integrates them into the form of the medium. It makes them apart of the game. To see the credits you must pursue the flowers and have them bloom. 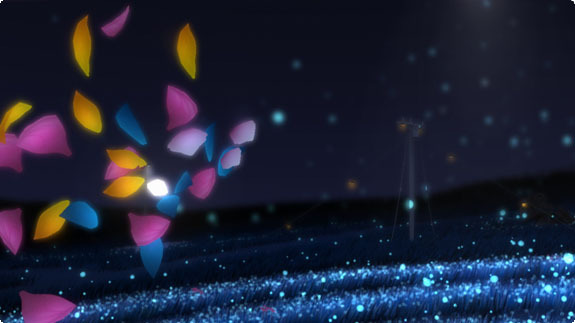 Then at the end, the flower train flies into the night sky as the names are collected in more traditional scrolling fashion and fly into the night sky. We have sent them to the heavens above and so concludes the game. I don’t know what this ending level means, but I feel it appropriate with the rest of the game. Few games integrate their credits into the game dynamics and make them playable. Instead most use them as a reward for completing the game. This method is much more satisfying. I’m glad they did it in a way that feels thematically relevant. I don’t know how, but at least it is aesthetically consistent with the tone and design of the rest of the work.